The Saxophone is a fundamental element of the sound of Like A Lady. 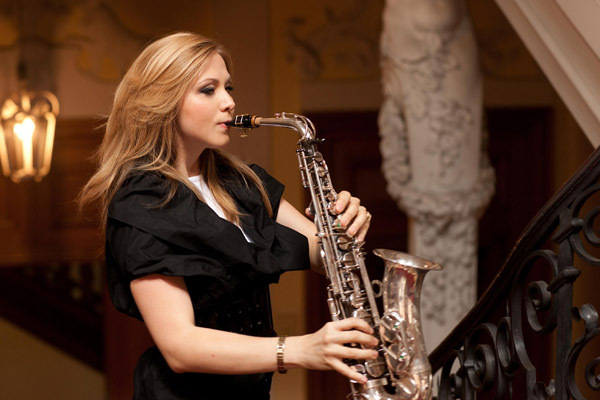 While Monika, the saxophonist, is always managing to perform in a suitable style, whether jazz, soul, pop, world music or classical music, she also plays five other instruments. So it seems obvious that rough and cool jazz sounds are as well prepared as crystal clear saxophone sounds of the classical music of composers like Maurice Ravel or Alban Berg. Most of the events she plays alto and tenor saxophone, however, she can provide more delicate timbres with soprano saxophone and flute as well. Monika’s saxophone sound is defined by her huge dynamic range and variety of sounds, and her stage performances are characterized by her vivid energy, which she channels through her music. Monica’s talent includes as well catchy melodies and virtuoso improvisations as popular saxophone sounds from pop, soul and rock’n’roll. Performing on stage means more for Monika than just to entertain, because it also means to communicate, to inspire, and to be at the same level as the audience. Despite her young age, she can already present a successful career: having performed in more than 20 countries and some of them include many world-famous stages such as the Munich Philharmonic, Vienna Concert Hall, Stadthalle Wien, Augsburg Opera and St. Petersburg Jazz Club. With over 120 corporate events per year, her extraordinary playing and her friendly appearance have established Monika as one of the most popular artists in the event and show business across German speaking countries.